This sandbox is currently being used to provide more details about the Skyrim Special Edition guide, specifically errors (when in doubt, UESP details take precedent). The Collector's Edition of the guide is being used as reference. 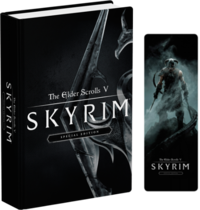 The Elder Scrolls V: Skyrim Special Edition Prima Official Game Guide covers the Special Edition release of Skyrim. This version of the guide, alongside David Hodgson, was also written by Stephen Stratton and Steve Cornett. 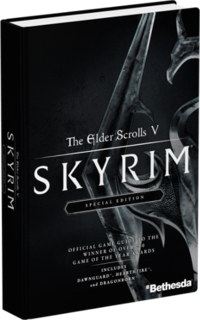 The guide does not cover the Creation Club retroactively added to the Special Edition after its release. This section begins with the English and Dovah lyrics of the Song of the Dragonborn. The rest of the section introduces each playable race, their stats, and suggested play styles, the skills system and game difficulty, character archetypes, combat, shouts, and magic, disease, vampirism, and lycanthropy, crime, Xbox Kinect voice commands, crafting, exploring the many locations found across the province, books, questing, buying property, followers, modes of transport, traders and services, collectable items, and all of the new additions introduced in Hearthfire. The Racial Advantages subsection claims Ancestor's Wrath Dark Elf Racial Power inflicts 10 damage per second, when it only does 8 points of damage per second, and also claims it to be weaker than Flame Cloak, when they share the same base stats. The Racial Advantages subsection also claims a Khajiit's claws deals "4x unarmed damage". In actuality, they only deal 12 points of damage as opposed to the base 10 the other races deal. The second captioned image in the Legendary Difficulty and Skills subsection spells "Skyrim" with a lowercase S.
The Trainers of Skyrim and Solstheim subsection claims Ahkari is a Journeyman Pickpocket trainer and Garan Marethi is an Expert Destruction trainer, when in fact they don't provide any training whatsoever. The Improving Skills: Skill Books subsection claims that only three copies of Legend of Krately House, four copies of Sacred Witness, and four copies of Three Thieves can be found in set locations, when five of each can be found, and only five copies of The Red Kitchen Reader can be found, when six can be found. The Combat Skills: The Path of Might - Smithing subsection claims a Smithing level of 20 is required to obtain the Steel Smithing perk, when it can be obtained at the base level of 15, and a level of 40 is required to obtain Elven Smithing, when it can be obtained at 30. The Combat Skills: The Path of Might - Heavy Armor subsection, under Racial Benefits, claims Nords have an extra 10 points to Heavy Armor instead of Orcs. The Combat Skills: The Path of Might - Block subsection claims each Shield Wall rank blocks 20%, 25%, 30%, 35%, and 40% more efficiently. Whilst this description is officially correct, a bug in the game changes these percentages to 10%, 20%, 30%, 40%, and 50%. This page was last modified on 8 September 2018, at 08:31.